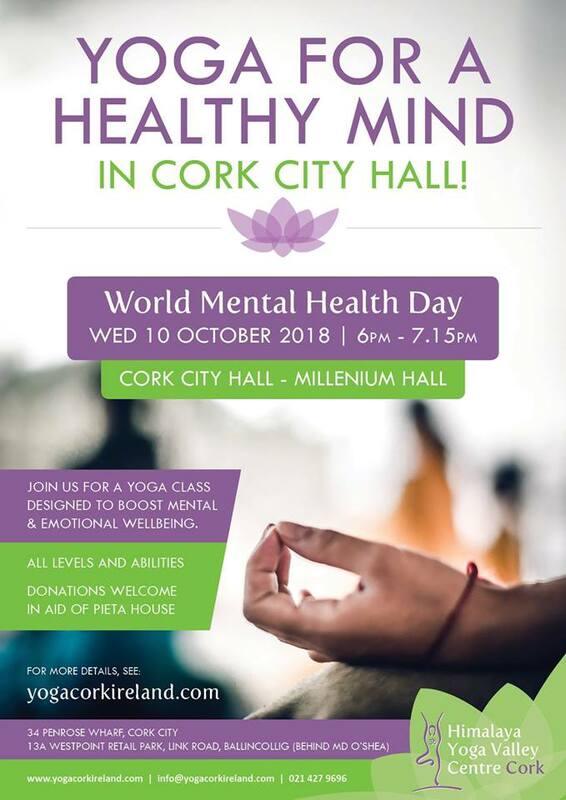 Himalaya Yoga Valley in partnership with the Cork City Council will be hosting ‘Yoga for a Healthy Mind’ on the evening of Wednesday October 10th to support World Mental Health Day. This already booked out event being organised to promote mental and emotional wellbeing will take place in the beautiful setting of the Millennium Hall in Cork City Hall and will be in aid of Pieta House. The event will include a Yoga for Joy class led by Lisa Fahy, Senior Teacher at Himalaya Yoga Valley which will be sequenced specifically to guide participants though the real benefits that Yoga can have for managing and improving mental health. The night will also include a short talk from Mental Health expert Pat Dermody from the Hazelton Clinic entitled ‘ “5 Habits for a Healthy Mind”. This event forms part of a global initiative run by Himalaya Yoga Valley, alongside our graduate teachers and their students from around the globe will come together to actively promote yoga as a path for mental wellness. Free classes will be held on 10th October in over 10 different countries including UK, USA, Ireland, Canada, Australia, Germany and Abu Dhabi. These Yoga for a Healthy Mind classes will promote the benefits of yoga for mental health, and each class will be connected with a local mental health charity to raise money for them by participant donation. The 10th October World Mental Health Day is observed annually around the world, with the overall objective of raising awareness of mental health issues and mobilising efforts in support of mental health. The Theme for 2018 is Youth in a Changing World so in keeping with the theme in Cork this year Himalaya Yoga Valley will also be running free yoga classes at St. Aloysius School in Cork City on October 10th. World Mental Health Day is a great opportunity for us all to come together as a community and raise awareness of mental health. We are delighted to have the support of the Cork City Council with this event which we hope will highlight the incredible benefits yoga can have on mental health while also promoting awareness of the importance of mental health overall. The event will also launch our new Yoga for Joy class which will commence on Saturday October 13th at our Penrose Wharf Studio. This weekly class will also be a donation based class in aid of Pieta House which will allow us to continue to support the great work that they do. We can’t wait for you to join us!